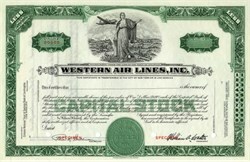 Beautifully engraved RARE SPECIMEN certificate from Western Air Lines, Inc . 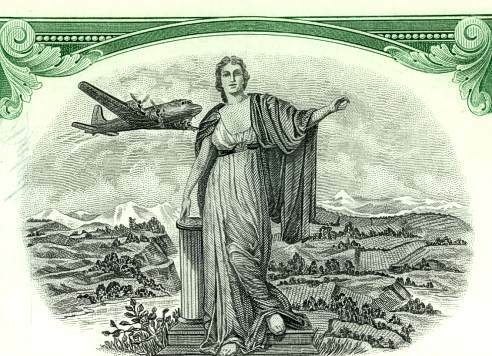 This historic document was printed by the Jeffries Banknote Company and has an ornate border around it with a vignette of an allegorical woman with an early passenger prop plane flying past. This item has the printed signatures of the Company�s President ( William A. Coulter) and Secretary. This the the first time we have had this certificate for sale. Western Air Lines was first incorporated in 1925 as Western Air Express, Inc., reincorporated in 1928 as Western Air Express Corp., and renamed Western Air Lines in 1941. The airline was acquired by Delta Air Lines, Inc. in 1987.